Use the various link posted on this page to access the official Riderwood Retirement job application online. Numerous types of careers can be searched/applied for via the company’s online careers site. Learn more about the online application/hiring processes by following the steps in the guide posted below. 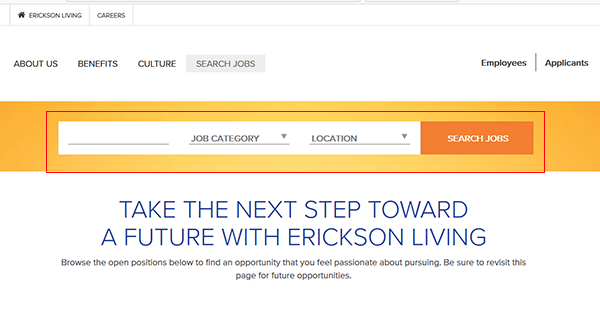 The company’s careers web-page allows you to search for current job openings, learn more about the types of positions that are available, as well as apply for numerous careers. About the Company: Riderwood Retirement is a retirement community located in Maryland. The brand is owned/operated by Erickson Living. The company is based out of Baltimore, Maryland and employs more than 20,000 people throughout the United States. 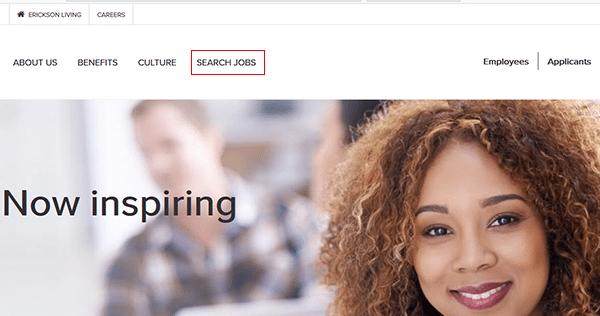 Step 2 – Click the “Search Jobs” button/link as outlined in the below image (to go to the next step of the job search process). Step 3 – Enter a keyword into the first field, and then select a job category/location from the two drop-down lists. Press the “Search Jobs” button to load the list of job opportunities. Step 4 – The list of current openings can be sorted by position, location, or date posted. Click the title/link of the job that you’re interested in applying for. You will be taken to the job description page. Step 5 – Read the job description and then hit the button that’s outlined in red in the below screenshot. Step 6 – Press the “New User” button under the login form and then agree to the privacy statement. Step 8 – After your account has been created you will be able to start submitting your details into the application form.